Previously I’ve written about why experts find it so hard to agree on spectrum regulation. However there is one aspect of spectrum that I haven’t touched on and that is the fact that radio waves are invisible, which turns out to be a basic practical challenge. Radio waves are all around us yet they are imperceptible. We intuit their existence through technology but we have no means of seeing what frequencies are in use or how busy it is. There has been at least one interesting art project aimed at making WiFi visible but in general we rely on experts to tell us what is in use and what isn’t. And indeed if we look at a chart of spectrum allocation from the FCC, the United States communication regulator, things do look fairly full up. One of the first insights I had into the potential of dynamic spectrum allocation was work carried out by the New America Foundation and the Shared Spectrum Company back in 2003 that simply set out to measure spectrum occupancy from New America’s offices in Washington DC. This early study revealed a lot of unused spectrum. Shared Spectrum has gone on to publish measurements from several spectrum occupancy studies since then. This information is incredibly useful as it revealed that only a small fraction of the spectrum that has been allocated by regulators is actually in use. Back in 2009 when I was advocating with others for TVWS regulation, we looked into getting a spectrum occupancy scan done in South Africa. Simply finding a company with the expertise and equipment to do it was difficult enough but even more challenging was the price tag: many thousands of dollars. A lot has changed since then and the last few years have seen the arrival of low-cost DIY spectrum scanners from companies like Nuts About Nets who make the RF Explorer series of spectrum scanners which range in price from USD119 dollars upwards. This is a real breakthrough for both researchers and policy advocates. In 2012, when Marco Zennaro and Ermanno Pietrosemoli from the Abdus Salam International Centre for Theoretical Physics (ICTP) worked with the Prof Chomora Mikeka of the University of Malawi to explore the potential of a TVWS pilot there, they were able to take advantage of the RF Explorer to carry out affordable spectrum occupancy scans that provided critical evidence in order to allow a TVWS pilot to proceed. But things haven’t stopped there. Around the same time that Marco, Ermanno, and Chomora were make plans to scan spectrum in Malawi, wireless hackers elsewhere were discovering that a inexpensive usb dongle designed for digital television broadcast reception, which sold for less than USD20, contained a Software Defined Radio chip that could operate on any frequency under 1GHz. This magic combination of affordability and openness spawned a new community of wireless hackers developing applications that take advantage of this dongle, known as the RTL-SDR. The development of Open Source software by Osmocom that could drive the RTL-SDR chips provided a platform for a variety of applications to be developed on this platform. There is now a vast variety of software applications for the RTL-SDR that can do things ranging from television or radio broadcast reception to tracking ships at sea to monitoring satellites. However, one of the challenges with spectrum monitoring is that it is highly dependent on location and on the sensitivity of the both the monitoring device and its antenna. Being inside or outside or on top of a mountain or down in a valley will have a significant effect on how spectrum is measured. Inexpensive equipment like the RTL-SDR dongle may not register spectrum that a more expensive, more sensitive device might pick up. Thus spectrum scanning devices need to be calibrated in order to provide credible evidence. Or do they? In recent years, a host of new participatory research initiatives that allow ordinary citizens to participate in serious science projects have begun to change the way we think about research. Known as citizen science or crowd science, these projects harness the interest of amateur or non-professional scientists often leveraging the power of the Internet to gather input from a huge range of participants. Citizen science has spawned non-profit organisations like the Public Lab in the United States that were founded specifically to develop and apply open-source tools to enable citizen involvement in environmental science. A great example of crowd science is the Quake-Catcher Network. This is a research network that takes advantage of the fact that most modern laptops have hard-drives with built-in accelerometers that detect movement. Designed to stabilise the hard drive in the event that the laptop is shaken or dropped, the accelerometers can also detect motion as a result of an earthquake. However, a hard drive accelerometer has never been calibrated for use in monitoring earthquakes and a single hard drive accelerometer on its own would not provide meaningful information about an earthquake but hundreds or thousands of these devices networked together can provide more comprehensive information than the most sensitive seismograph. You see where I’m going here? Low-cost devices like the RTL-SDR dongle could be used for a citizen science project that would not only provide a wealth of critical information on spectrum occupancy in African countries (well anywhere actually) but would also be a practical introduction to radio spectrum for electrical engineering students across the continent. Education and research directly connected to proactive regulatory reform: who could ask for more? The more institutions or individuals that participate, the more accurate the research becomes and the more potential there is to compare regions and countries. Something like this could also be used to validate and inform the spectrum propagation models used by geo-location databases. Emmanuel Togo and Ato Yawson compare readings. To test this idea, Emmanuel Togo of the University of Ghana Legon and I arranged to do some test spectrum scanning in Accra last month. 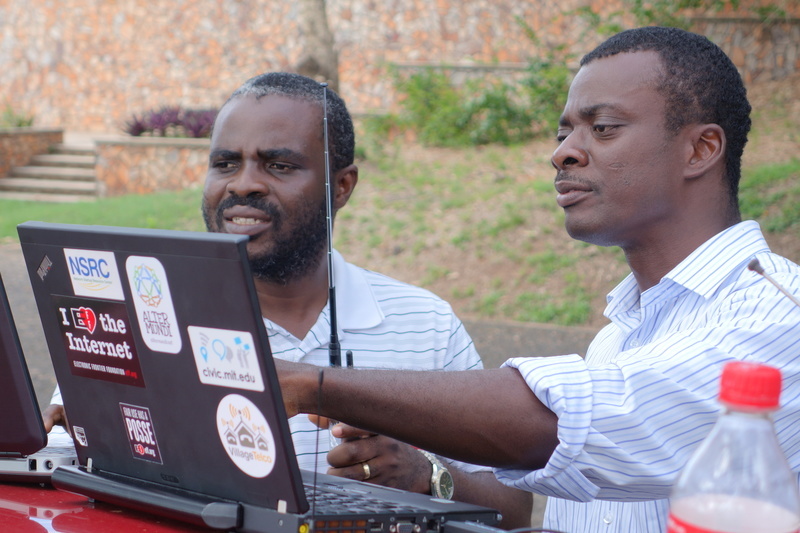 We set out for the top of the hill that dominates the UG Legon campus armed with both RF Explorers and RTL-SDR dongles. It took a little while to get everything working but below you can see some screenshots from the RF Explorer using their Touchstone spectrum scanning software. And by comparison, here are a similar set of screenshots taken from the RTL-SDR dongle using the Open Source RTLSDR Scanner software. You can see that the the readings are similar across the two devices. It isn’t possible to make an absolute comparison between them the Touchstone software is displaying signal strength in dBm and the RTLSDR Scanner software is displaying in dB/√Hz. To be honest I am still learning about the different ways in which the signal strength is being expressed but it is clear that they are both registering spectrum occupancy on the same frequencies. You can see that the UHF band is moderately occupied with plenty of unused bands. This is in the highest point in Accra, arguably a point of highest spectrum occupancy in the country. With inexpensive spectrum scanning technologies, we have captured information that can directly inform a debate on how UHF spectrum ought to be utilized. I don’t particularly believe in the old adage that “you can’t manage what you can’t measure” but in this case, having direct evidence of spectrum occupancy puts any conversation with regulator or ministry of communication on a firmer footing. With some work towards standardizing how spectrum scans are done, I can imagine these inexpensive devices producing a rich picture of spectrum occupancy over an entire country. The UK regulator, OFCOM, has done a great job of visualising spectrum allocation in the UK. Most interesting for me is a little link at the bottom where you can download the data source for the map in JSON format. Imagine being able to take a data file with the spectrum allocations and overlay spectrum occupancy data on top of it. That would be pretty useful in terms of identifying spectrum bands lying fallow. So imagine an army of students, researchers, concerned citizens all scanning spectrum with an inexpensive device (I paid $17 each for the ones I bought) and uploading the data where it could be used to paint a comprehensive picture of spectrum occupancy across a country or even across the continent. Time for everyone to go on a spectrum safari!